Produced by Carl Laemmle Jr.; directed by James Whale; written by Benn W. Levy, from the novel by J. B. Priestley; cinematography by Arthur Edeson; edited by Clarence Kolster; set direction by Russell A. Gausman; music by David Broekman; starring Boris Karloff, Charles Laughton, Melvyn Douglas, Raymond Massey, Gloria Stuart, Ernest Thesiger, Lilian Bond, Eva Moore, Elspeth Dudgeon, and Brember Wills. Blu-ray or DVD, B&W, 72 min., 1932. A Cohen Media Group release. The Old Dark House has always been the odd movie out in Universal Pictures’s illustrious run of horror films in the Thirties. For one thing, it was really only a Universal picture for twenty-five years, at which time it lapsed into limbo as the studio lost the underlying rights. For another, it’s less a horror film than a series of pre-Code provocations arranged by James Whale, the director of Frankenstein (1931), its sequel Bride of Frankenstein (1935), and The Invisible Man (1933), which starts with the word “Hell!” as its first spoken word and proceeds in a playfully macabre vein. 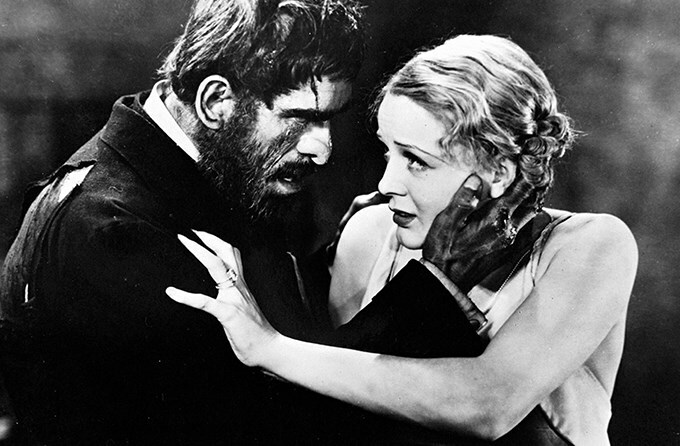 Morgan (Boris Karloff) has Margaret (Gloria Stuart) in his clutches. Closely adapted from Benighted, an early novel by J. B. Priestley, and influenced by the spooky antics in the stage and screen hit The Cat and the Canary, The Old Dark House was the eagerly awaited reteaming of the star and director of Frankenstein, the prior year’s smash. But in its day it disappointed on both counts. 1932 was the breakthrough year for the forty-five-year-old Karloff, with a flashy supporting role in Howard Hawks’s Scarface and leads in The Mask of Fu Manchu and The Mummy, the latter his other great horror characterization for Universal. While the drunken Morgan makes a memorable impression visually, particularly when chasing the creamily beautiful Stuart around, he’s a red herring in the story. Karloff doesn’t have much unique to do until Morgan’s tearful climactic embrace of Saul, the two monsters sharing their own peculiar bond. Roger (Melvyn Douglas) gets the point. Whale made only those four films in the genre but he had smashed the mold with Frankenstein, and while The Invisible Man and Bride of Frankenstein seamlessly blend horror and comedic elements, The Old Dark House, stagier and less stylized than the others, has as many nooks and crannies as the Femm mansion. The jolts, from clutching hands and distorted mirrors, play second fiddle to the detours that lend the film its fascination. Coming from an openly gay director, who added much of the off-kilter humor to Priestley’s plot, it’s a queer film in more ways than one. The bickering Horace and Rebecca register as much as an old married couple as siblings (“My sister was arranging these,” says Horace of some flowers, which he then tosses into the fireplace) and rumors of their murder of another Femm are bandied about. They argue about religion, with Horace angrily dismissive and Rebecca haughtily observant, obsessive over the sleeping arrangements (“no beds!”), and mindful of propriety (touching Margaret’s low-cut gown, she comments, “fine stuff, but it’ll rot,” then, feeling her skin, adds, “finer stuff still, but it’ll rot, too!”). The two are almost out-weirded by Saul, a harmless, inbred-looking pyromaniac who engages Roger in polite conversation until the knives literally come out. Stranger still, however, Whale had an actress portray Roderick, with a woman’s voice that adds a note of transvestite camp to the movie. Allegedly, Whale couldn’t find an aged actor for the part, a convenient excuse for another tweaking of convention. Morgan is restrained by Roger and Sir William Porterhouse (Charles Laughton) as much of the rest of the cast looks on. The Old Dark House marked the Hollywood film debuts of Thesiger, who would perfect this act in Bride of Frankenstein as the mad Dr. Pretorius, and Laughton. As Porterhouse, Laughton is amusingly overdone, as a class-conscious widower who purchased his title and Gladys. (When he threatens more backstory at dinner, Horace silences him with a memorable line, “Have a potato.”) Gladys falls for Roger over the course of the evening, resulting in stilted love scenes, and Roger’s proposal of marriage, with Porterhouse’s blessing (his relationship with her is explained as platonic) isn’t the best ending. I prefer to think of this “positive,” and unconvincing, subplot as cover for all the seaminess Whale crammed into The Old Dark House. Traces of The Old Dark House turn up throughout the long history of old dark houses in movies, from the Bob Hope remake of The Cat and the Canary (1939) and Abbott and Costello’s Hold That Ghost! (1941), to American Gothics like Spider Baby (1967) and The Texas Chain Saw Massacre (1974), and Suspiria (1977), where the panicked flight of a victim through a howling storm recalls Stuart’s. (The 1963 remake of The Old Dark House, a coproduction between Columbia’s gimmicky producer William Castle and that decade’s reigning fright factory, Hammer Films, leans on comedy and is instantly forgettable). But it’s very much its own thing, and the Cohen Media Group’s 4K restoration shakes the dust off of the image. The supplements include archival booklet and video interviews with filmmaker Curtis Harrington (Night Tide), who befriended the long-retired Whale in the Fifties, and was instrumental in excavating The Old Dark House from decades of neglect. In a new video segment, Karloff’s daughter Sara talks about her father’s toil on the film (getting up at 3:00 a.m. to begin the painstaking four-hour makeup sessions with the legendary Jack Pierce, with another three hours at the end of the day to remove the appliances) and his relationships with Whale (professional) and Laughton (uneasy, though they would reunite for Universal’s period chiller The Strange Door in 1951). James Curtis, author of James Whale: A New World of Gods and Monsters, contributes a detailed commentary that gives all the key production personnel their due and offers interesting trivia (Charles Addams adapted Morgan into Lurch for his cartoons and subsequent TV show The Addams Family). Gladys (Lilian Bond) flirts with Roger.